It may be the last gasp of April, and therefore the end of Poetry Month, but I’ll be writing poems long after April has waved farewell to us all. I hope you, too, won’t be shackled by the rather arbitrary calendar. Still, it’s nice to have a continued and vibrant focus on poetry. For the last three Sundays, I’ve been sharing out the poems that I have written this April, using (for the most part) the prompts at Global Poetry Writing Month/National Poetry Writing Month each morning before I do much else. You can read my first week here, the second week here, and the third week here. You’re here at the fourth week of writing. I’ve been composing my poems over at Notegraphy, and my gallery is here. 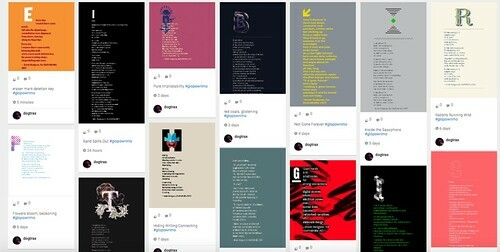 I’ve enjoyed using Notegraphy instead of my blog because it allowed me to keep the poetry writing separate from other writing, at least until I curate the poems, like now. There’s also the interesting design element of Notegraphy. It hasn’t felt much of a burden to write 30 poems, one each day, but maybe that is because of my system of writing early in the day, fueled by morning coffee, and just going with the flow of whatever the prompt has sparked. I always say this when I do a bunch of writing, but I hope to someday go back and edit/revise the poems and pull them together in a more cohesive fashion. Someday. Maybe. Here are some opening lines from this past week’s writing, with links to the full poem, if you are interested, from the week behind us. Bitter ashes on the tongue. I hope you wrote, and that you write, too. You know a book has captivated your attention when you find yourself on the edge of your seat, wondering what will happen next, and then stare for a long time at the cliffhanger at the last page. Such was the case with the second book in The Nameless City trilogy by Faith Erin Hicks entitled The Stone Heart. (I wrote about the first book — The Nameless City — here). Hicks has tapped into the very elements that make graphic novels so special to read and experience — using her artwork, historical research and development of characters, Hicks has created an imaginary world (based on Ancient China and the Silk Road) that feels alive and real. The artwork is really exquisite and detailed. 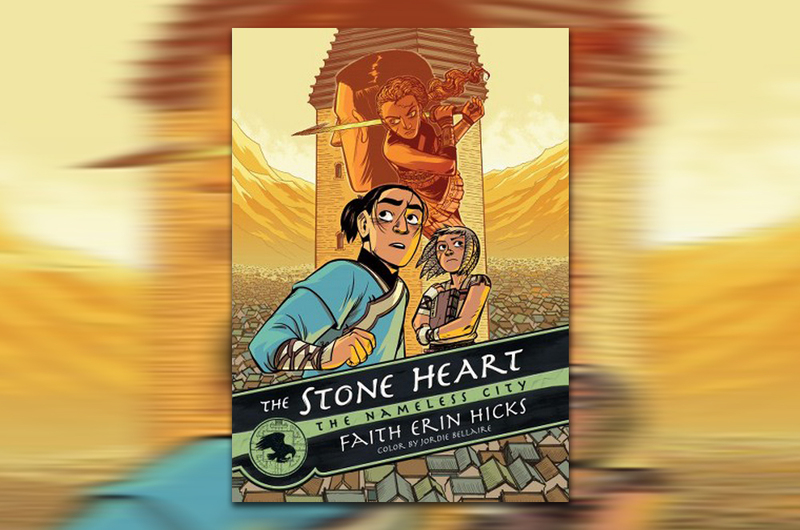 Reaching the end of The Stone Heart is a disappointment but only because Hicks is still working on the third, and final, installment of the story. And what is this story? A city of mixed tribes and people that has two potential paths — war and conquest, or peaceful transition in which all tribes determine the future. For now, war has won out, or the prospect of war, and our two main protagonists — Rat, an orphan girl raised by monks in the Nameless City, and Kaidu, son of a Dao warrior — are faced with a dangerous task that may shape the Nameless City for years to come. The mysterious backdrop to the story is a past people — the ones who first built The Nameless City and whose reign mysteriously came to an end — and a hidden book that contains a power of great destruction, a book once protected by monnks that has now fallen into the hands of a young leader who has killed his father in order to ascend to power. He believes the book will forge his way forward. Others, like Kaidu and Rat, understand that the book was hidden for a reason and fear what it may unleash on the world. The Stone Heart is an adventurous book that stays true to its historical (if fictional) roots of Asian culture. It continues the magic of the first book, and I am hopeful Hicks will bring the overarching story to a close with the third book with all the elements that has kept me reading (as well as my middle school son). The Nameless City series is appropriate for upper elementary, middle and high school students, with some violence as part of the plot of palace intrigue. The title is what caught my attention: The Poet’s Dog. Poetry. Dog. Book. I’m in. 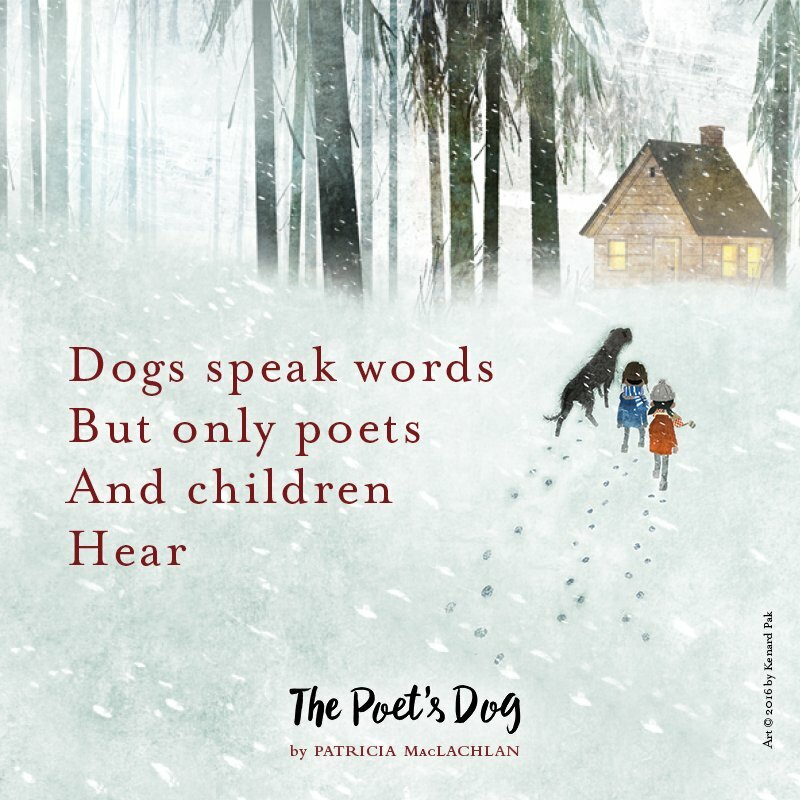 The Poet’s Dog has beautiful prose, with whispers of poetry everywhere, as the story explores the notion that dogs can talk to children, and to poets — both of whom have open ears and open hearts to the world. Here, a dog saves two children in a winter storm, and then the children save the dog from his sorrow, and in-between, we learn the real story of Teddy, the dog. There are no wasted words in MacLaughlan’s book. 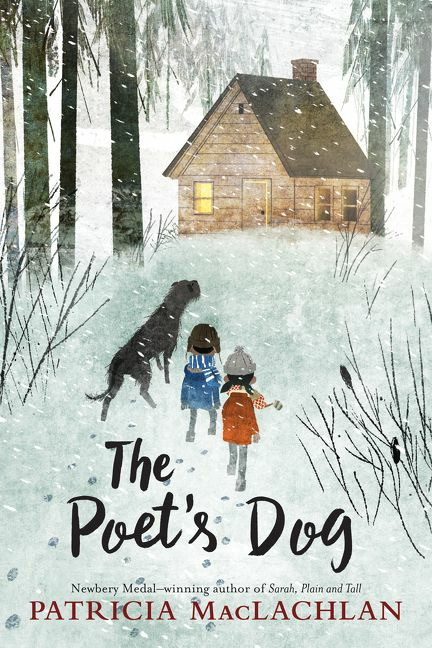 Each sentence, each piece of narrative, is there for a reason, and I found myself in the poet’s house, huddled up amid the fierce winter storm, as the dog and children become part of each other’s lives with words and love. The ending, too, is very satisfying, if not too surprising, allowing us a glimpse into the kindness of the world, and the possibilities of poetry. Dogs. 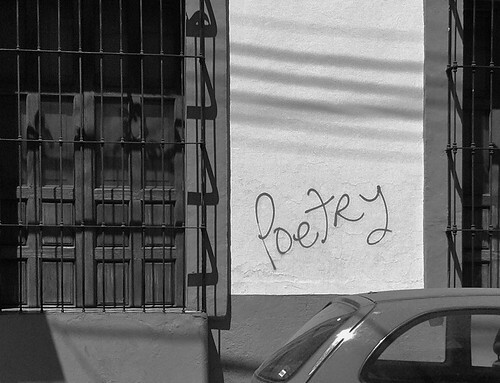 Poets. Kids. Kindness. What’s not to love about all that? I came stomping into the house, overstating my frustration. Silence. He was trying to figure out what I was getting at. “Yeah?” he answered, rather reluctantly. Silence. Now he could see where this was going. My wife, who is much more of a stickler for public spelling errors than I am, joined in. I chimed in. “Let me help you find some, then,” and I did, and he and I walked out to what he wrote. We stared at the sentence for a bit. 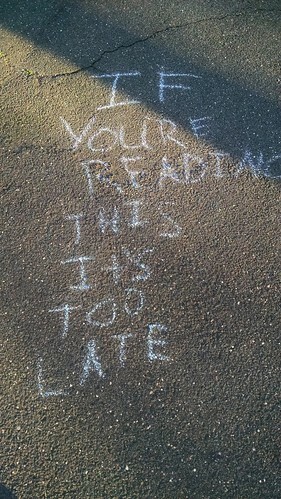 If your reading this, it’s to late. “You’re is a contraction. You and Are. To means also. 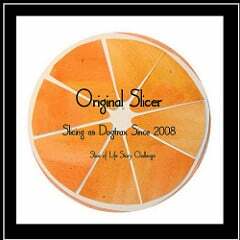 Double o’s,” I pointed out. He reached down and fixed the two words, with a big more dramatic chalking than was necessary. “This is so ridiculous,” he muttered, and then wandered back into the house, tossing the chalk for good measure. Tomorrow is the first of two days of our state testing season for ELA (reading and writing) for my sixth graders. For my latest monthly column at Middleweb, I wrote about how I try my best to navigate the season with my students without turning my classroom into “test prep central,” which I refuse to do. The world’s still asleep (mostly) and I am writing poems in the dark of the morning, fueled by some coffee. 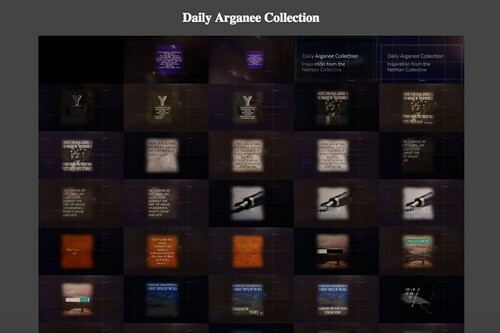 Every day, I have been writing some form of poetry suggested by the fine folks at Global Poetry Writing Month/National Poetry Writing Month, and each Sunday, I have been curating the poems from the week. So you can read Week One’s poems here and Week Two’s poems here, and now we are into Week Three. I have been sharing the first lines of the poems here, and then giving a link to the full poem over in Notegraphy, which has been my primary writing space for poetry this April. The first poem’s theme was invented words, and working them into poetic form. I love wordplay, so this poem flowed rather quickly for me that morning. The second poem was to be written in the form of a letter. I took the approach of a father to child, with some creative license. While it is inspired by my own family, some of the facts might not quite be true. Such is the freedom of the poet, right? This poem had the theme of a myth, so I imagined some God or Goddess reaching down to knit the Network. A prompt about childhood games as a point for inspiration brought me back to a game we used to play on pavement called Skully. One summer, that’s all we did, as I remember it. An overheard conversation became the focal point of this poem, as I tried to leave what was being discussed unsaid, and instead, I tried to show the verbal dance these two were doing. An environmental theme emerged on Earth Day, and although the form of the poem was one I did not know — a georgic — I sort of ignored that and kept my eye on the soil. And finally, this morning, there was a call for something known as an elevenie – a sort of cinquain variation with 11 words and four lines — so I combined three verses together, on the topic of creating and living an invented persona in Networked Narratives. And one more week or so of poems every day, and then … I will miss it, no doubt. Now, here’s a book with a cool story (and perfectly suited for read-aloud, as I did with my son) that comes with a perfect activity for all of us book-loving, game-loving fools of the world. 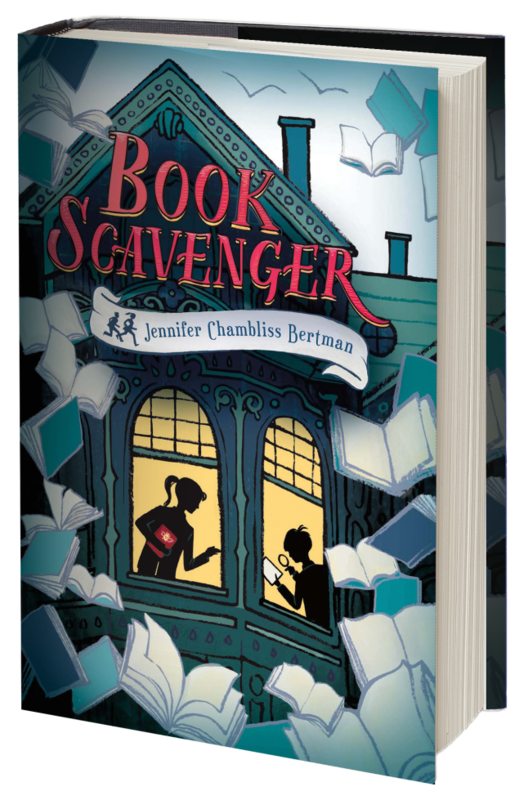 Book Scavenger by Jennifer Chambliss Bertman is a mystery story of sorts, as our protagonist, Emily, must solve a series of puzzles, found in books, to solve a larger mystery of a game set across the city of San Francisco. It all begins and centers on Edgar Allen Poe, but that’s about all I will say, so as not to give anything away. Suffice it to say that Bertman has infused her novel with a love of books on many levels, with allusions all over the place to much-loved classics, and established Emily Crane as a heartfelt character. Her family moves .. a lot. Her parents aim to live in all 50 states, and then write a book about it (they already blog about it), and so Emily (age 12) never connects with other kids her age. She knows it is all temporary. But James, a boy whose family owns the house where Emily’s family rents, is the first kid whose love of puzzles and challenges draws her into an unexpected friendship, as both kids try their hand at Book Scavenger, a website where people hide books and others find them, and collect points. Garrison Griswold, publisher and creator of Book Scavenger, has set in motion a new game, but then falls victim to a subway attack. Emily finds one clue and then game begins… and the story twists and turns, full of cryptic notes and odd discoveries. Now, the question is: what book shall we hide? And where?